Chunky scraps of wild game gently braised in tomatoes and milk create a fabulous sauce for homemade gnocchi. For years I’ve been working on my jinx of all recipes… gnocchi. You’d think something with just three ingredients can’t be tough to do, but I’ll tell you, gnocchi is more about technique than ingredient driven. Each time I make gnocchi, I feel myself getting closer to that perfect bite of tender, dumpling goodness. Gnocchi pair so well with the bolognese sauce, and it’s amazing to think the scrap parts of deer and wild pig are the best cuts for this sauce. No need to use the loin, just use whatever is left over from trimming. What I like most about this sauce, is oven braising it instead of the stovetop makes it so easy and requires minimal stirring. 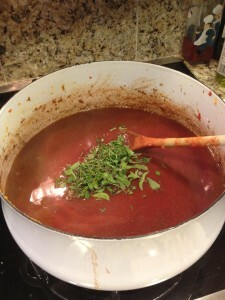 The oven also creates more of a roasted quality to the sauce. Traditionally, bolognese uses cream or milk to give the sauce a creamy taste, but I’ve found using either of those can curdle the sauce, so instead I use canned milk and it works perfectly. I start the sauce by finely chopping carrots, onion, celery and garlic in my food processor, then I sauté some pancetta in oil until it’s crispy and add the finely grated vegetables. Once the vegetables have caramelized slightly, I remove them and sauté scraps of meat. You can use ground wild game meats, but I prefer to cut the meat into very small dice. It’s just a texture that I like, but you can choose what you like. 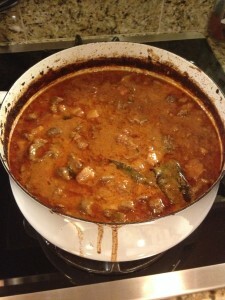 The way to create balance in the sauce, is by using various types of wild game. Mix venison with pig, or even game birds to create different flavors that meld together as the sauce cooks. 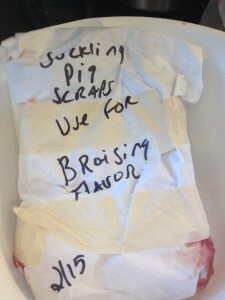 Once the meat is browned, I remove it and add an acid like red wine, along with venison or beef stock to keep the meat moist as it breaks down. A can of tomatoes and seasonings are also added. Then everything is added back into the pot along with a can of evaporated milk and in a 300 degree oven it goes for 3 hours. 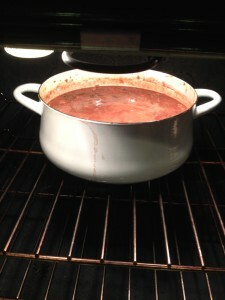 Since the idea is to cook away some liquid to make the sauce thicker, I leave the pot uncovered. What comes out is a deep, rich, flavorful bolognese with a creamy quality… just perfect for gnocchi! **See Homemade Potato Gnocchi for the steps to making perfect little dumplings for you bolognese. A delicious twist on a traditional meat and tomato sauce for homemade potato gnocchi. 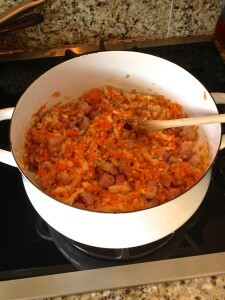 Finely chop carrot, onion, celery and garlic (or chop in a food processor) and set aside. Add the pancetta, two tablespoons grape seed oil and red pepper flakes to a large heavy bottomed wide pot over medium heat and sauté for about 3 minutes, until the pancetta is crispy. Add the carrot, onion, celery and garlic, and sauté for about 5 minutes, until the vegetables begin to caramelize, the remove the pancetta and vegetables to a bowl. Finely mince, or grind game meats and season with salt and pepper. Add the meats to the pot and lightly fry until browned. 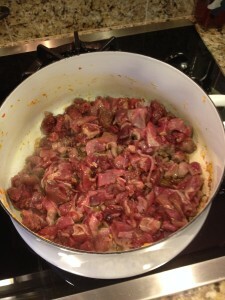 Remove the meats to a bowl. 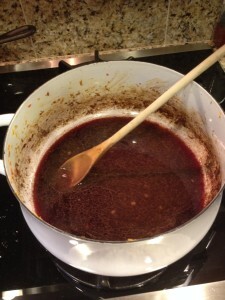 Add the red wine to the pot and heat for 2 minutes to burn off the alcohol. Add all the remaining ingredients back to the pot along with the caramelized vegetables, and meats. Place the pot in the oven, uncovered. Set a timer for every 30 minutes, and give the sauce a stir. Braise the sauce in the oven for a total of 3 hours, stirring every 30 minutes. 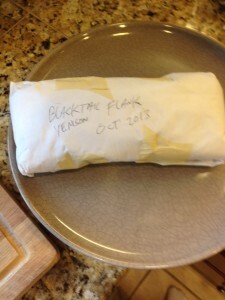 Remove the bay leaves and discard. 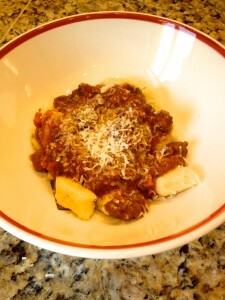 Serve the bolognese with gnocchi.